Is This Rajamouli’s Gimmick or Prabhas’s Injury? We have already reported that the shooting of the climax sequence of “Baahubali: The Conclusion” commenced yesterday at Ramoji Film City in Hyderabad. 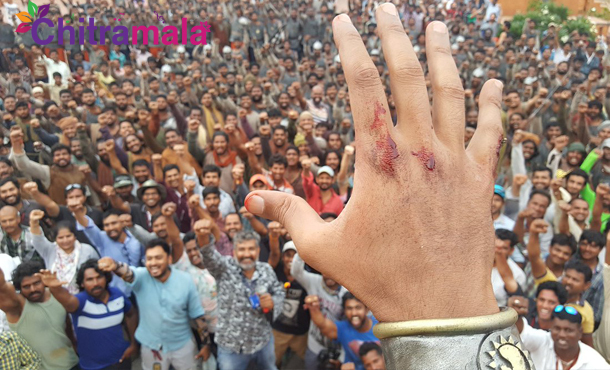 The ace director SS Rajamouli has yesterday posted a picture of Young Rebel Star Prabhas with bleeding fingers. The pic immediately started trending on social media with the star’s fans expressing worry feeling that Prabhas might have sustained an injury during the shooting. There was no official news from the film’s unit about Prabhas’s injury, but the pic has definitely kickstarted the hoopla for the much-awaited film. Few opine that the picture is an attention grabbing strategy of Rajamouli to let people know that the Rs 30 Cr visual spectacle aka the shooting of Baahubali climax has started. The climax war sequence shoot will progress for ten weeks, and the shooting will be wrapped up by September end. The movie is set for a worldwide release on April 14, 2017.